Alice was feeling in a good mood with me so I chanced asking her to help me track down the flame petals of the Legendary Rock Rose (again). She agreed and even helped me pack up the supplies (she says actually she packed all of the supllies and that I didn’t even bother asking her and just assumed she would do it). These petals are prized by one of the humans for turning into pictures, apparently they put the petals onto tissue or bloting paper and then sandwitch them in big heavey books to sort of iron them flate – this seems very strange to us Wiggly Pets but being naturally helpful creatures we felt the human needed a bit of cheering up and so set forth to collect as many petals as we could. The journy was long and arduos (Alice says not it wasn’t and if I did abit more regular exercise I wouldn’t have been panting the whole way – I feel this is exessively cruel of her.) 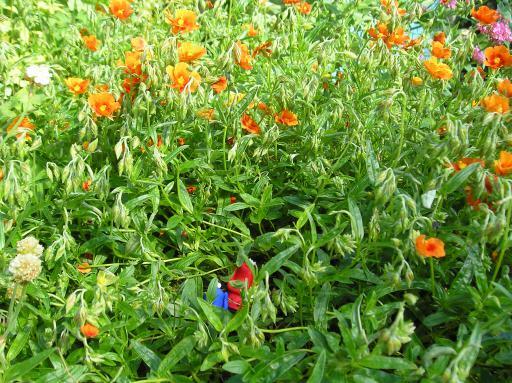 Anyway we found the Rock Rose and it does have the most amazing orange flowers, now one of the humans gets very unhappy about flowers being picked so we had to hunt around on in the jungle of the plant itself to find fallen petals. There were quiet a few fallen petals but most were shriveled, muddy or torn. After hours of searching (Alice says it was 15 minutes 20 at the most) we had a wodge of petals each. Feeling a sense of achievement we sat down within the shelter of the Rock Rose itself and eat a simple yet satisifing lunch of honey oat cakes, crystalised lemon crumbs and nettle tea. We fashioned tea cups out of rolled up leaves and though the ground was a bit damp it was quiet pleasant. We made it home with most of the petals in tact (Alice says no we got home with her petals intact as I had dropped mine in a puddle on the gravel river – I would like to point out that at this time of year the Gravel River is prown to floods and I bearly escaped with my life (Alice says – Stop exaggerating – I say Sigh why do I try?). Anyway the human was very pleased indeed and proceeded to whip them all away into books to be squashed – humans are very strange. Still it does produce some nice pictures with the squashed bits of plant.